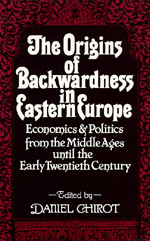 Reaching back centuries, this study makes a convincing case for very deep roots of current Eastern European backwardness. Its conclusions are suggestive for comparativists studying other parts of the world, and useful to those who want to understand contemporary Eastern Europe's past. Like the rest of the world except for that unique part of the West which has given us a false model of what was "normal," Eastern Europe developed slowly. The weight of established class relations, geography, lack of technological innovation, and wars kept the area from growing richer. In the nineteenth century the West exerted a powerful influence, but it was political more than economic. Nationalism and the creation of newly independent aspiring nation-states then began to shape national economies, often in unfavorable ways. One of this book's most important lessons is that while economics may limit the freedom of action of political players, it does not determine political outcomes. The authors offer no simple explanations but rather a theoretically complex synthesis that demonstrates the interaction of politics and economics. Daniel Chirot is Professor of International Studies and of Sociology at the University of Washington.